Admittedly, the story sounds like a sentimental Lifetime movie that could have been better if the two protagonists fell in love. But at least they are making beautiful music together, so that counts for something. Nadir Aslam, an early music violinist in Manhattan, is suffering from a medical condition called collapsed lung, and requires serious surgery. Kristin Olson, a New York-based early music oboist, has the exact same condition, and has just undergone the same surgery Nadir faces. The two have never met...until a mutual friend realizes what they are both going through and brings them together. Kristin, a highly empathetic Seattle native, counsels Nadir on what to expect when he is in the hospital. "As soon as I met him, I knew I wanted to make music with him," Kristin says. Of course, both find the experience of hospitalization painful and depressing. Nadir recalls the "soothing sounds" of piano music wafting toward his room from the massive atrium in the lobby of Mount Sinai Hospital, where, in one of those Lifetime-like quirks, both Nadir and Kristin have their operations. Oprah, can you hear me? Wouldn't it be nice, Nadir muses, as he recovers, to be able to "give back" to the hospital by bringing early music concerts--what he and Kristin do best--to the very same atrium? And so they did, birthing a series of early music in the atrium of Mount Sinai's Guggenheim Pavilion. 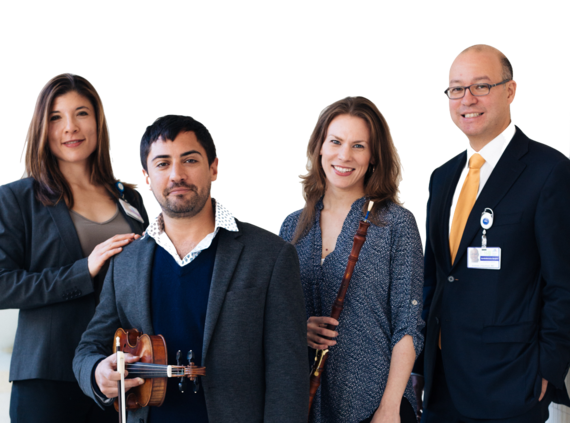 Nadir and Kristin weren't the only early music exponents who wanted to perform at Mount Sinai. "Once we told our friends in the early music community," Kristin says, "everybody wanted to perform." So one of their first six concerts was a six-hour marathon of baroque music, much to the delight of hospital patients and staff. The next concert, Monday at noon and open to the public, features two-time Grammy-nominated Bach Choir of Holy Trinity , under the direction of Donald Meineke, in a program titled Music of the British Isles. Hey, how often do you get to hear Danny Boy played in a hospital? There's no point in advising HuffPost readers to get their tickets early, because the concert is free and open to the public. "It's incredibly satisfying," Nadir says, of the concert series at Mount Sinai. "We want to expand this to other hospitals and turn it into an ongoing venture. "To me, that's a lot more satisfying than playing in a church somewhere for a bunch of people who already know the music. It's our way of giving back." In the photo by Tatiana Daube below, Nadir and Kristin appear with their respective surgeons, Drs. Andrea Wolf and Andrew Kaufman. Nadir and Kirstin are fundraising through their website to broaden the mission to include other hospitals. "Obviously the people who are in the atrium see us playing," Nadir says. "But we also know that the patients up in their rooms, the ones who are not well enough to come down, can hear us. And that's the most satisfying thing of all." 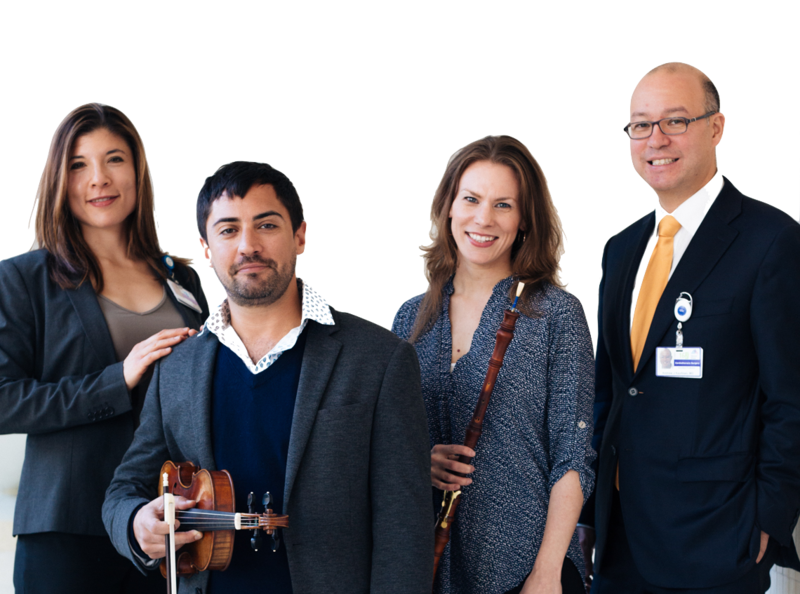 Mount Sinai Concerts for Patients, Monday, May 30, noon, Mount Sinai Hospital, Guggenheim Pavilion, 1190 Fifth Avenue at 101st Street, New York City. For further information, MountSinaiConcerts.org.